Tá ár scoil taréis páirt a ghlacadh i dtrí thionscnamh difriúl le Comenius . Is scéim Eorpach é seo chun scoileanna, daltaí agus múinteoirí san Eoraip a chur ag obair lena chéile.Táimid taréis alán a fhoghlaim ό na scoileanna eile san Eoraip le blianta anuas. Tá crainn againn ar shuíomh na scoile curtha ag múinteoirí ό na scoileanna go léir a bhí ar chuairt chughainn. Fuaireamar aitheantas mar " Star project" i 2012 ón EU don méid oibre a cuireadh isteach sa tionscnamh deireannach. 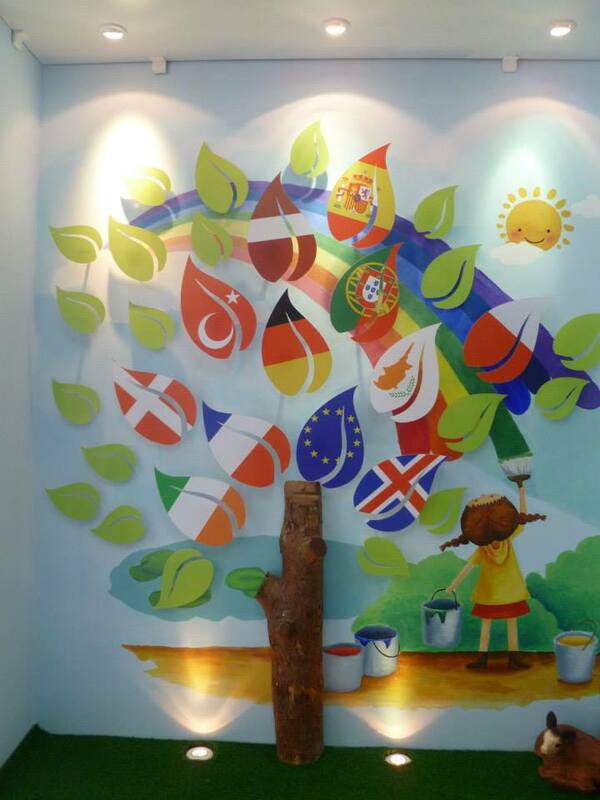 Our school has taken part in four different Comenius projects, with schools in different European countries. Comenius is a European schools based project, to enable children and teachers in European schools to work together. Gaelscoil Faithleann was the coordinator school for this project . A meeting of European teachers was held in Killarney to organise the project in October 2012. There were 11 countries in this project ; Cyprus, Denmark, France , Germany, Iceland, Ireland, Latvia, Poland, Portugal, Spain and Turkey. The project finished in June 2015. We are going to take a break from European Schools projects for a few years now. We have learned lots about Education in Europe from our partner schools. Each group of teachers from the different schools who have visited us down through the years, have planted their National Trees at our school, to remind us of our work together. "Cúrsaí Spόirt/ Sports" with schools in Finland, Italy, Poland and The Netherlands. "Divided by the Sea, United by History" with schools in Norway, the Czech Republic and Greece. "Cois Farraige / Living by the Sea" with schools in Iceland, Denmark, France, Portugal, Greece, Latvia and Guadeloupe. Here we have some photos and information on this project. You can also visit our Danish coordinator schools website at www.gug-skole.skoleintra.dk and visit their international section for information on our entire Comenius project. This project was awarded " Star Project" status by The EU in 2012.